Streamlining communication can save hours of labor and prevent mistakes. Sending certain messages at pre-defined stages of communication not only keeps the customer and agents informed about specific events, but it can also aid your agents by programmatically doing automated updates to the customer. The flexible OTRS is an industry leader in email communication and offers you complete control of notifications based on any event in your system. Use this screen to add ticket notifications to the system. In a fresh OTRS installation several ticket notifications are already added by default. The ticket notification management screen is available in the Ticket Notifications module of the Communication & Notifications group. Click on the Add Notification button in the left sidebar. Fill in the required fields as explained in Ticket Notification Settings. Click on a ticket notification in the list of ticket notifications. Modify the fields as explained in Ticket Notification Settings. Click on the trash icon in the list of ticket notifications. Click on the Export Notifications button in the left sidebar. Choose a location in your computer to save the Export_Notification.yml file. Certain settings are exported as numeric IDs and will break when importing to a system where these settings do not appear or reference other named items. Click on the Overwrite existing notifications? checkbox, if you would like to overwrite the existing notifications. Click on the Import Notification configuration button. For an example, see a default ticket notification which is included in a fresh OTRS installation. The notification won’t be displayed in agent preferences. The notification is sent to all appropriate agents by the defined method. The notification will be displayed in agent preferences for selection. The agents may opt-in or opt-out. Yes, but require at least one active notification method. The notification will be displayed in agent preferences, but require at least one active notification method. This is annotated by an asterisk next to the name. This message will be shown on the agent preferences screen as a tooltip for this notification. Here you can choose which events will trigger this notification. An additional ticket filter can be applied below to only send for tickets with certain criteria. The values in this list can grow as your system grows. 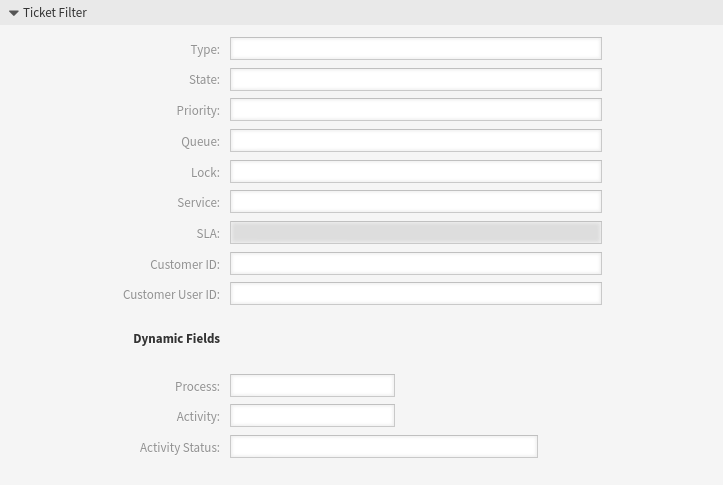 The more Dynamic Fields are and features you have in your system, the longer the list will be. Filter for a state of the ticket. Filter for a priority of the ticket. Filter for a queue in which the ticket is located. Filter for a lock state of the ticket. Filter for a customer ID of the ticket. 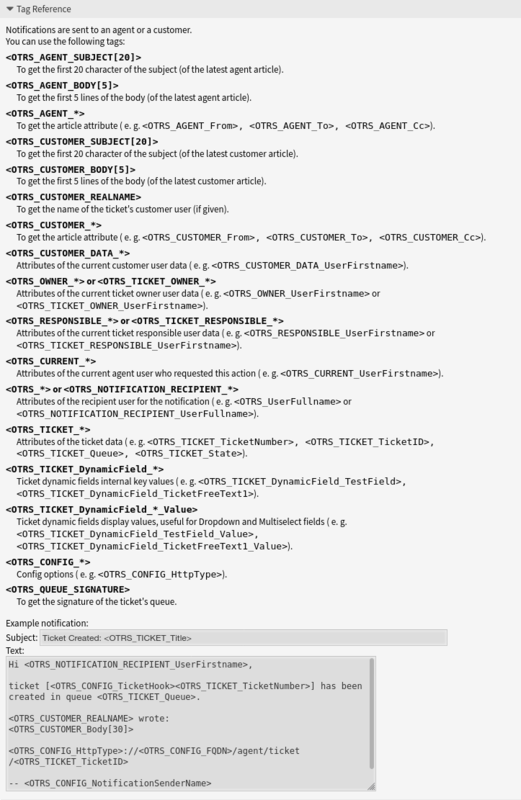 Filter for a customer user ID of the ticket. Filter for some dynamic fields added to the system. For the complete list of dynamic fields see the Dynamic Fields chapter. 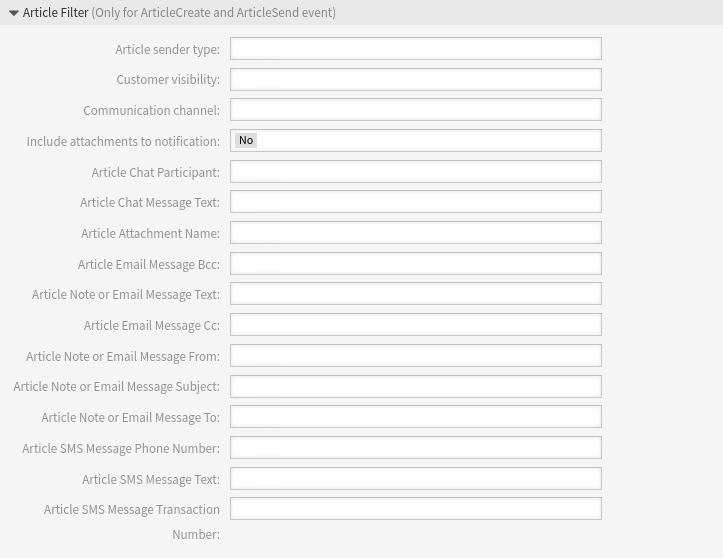 This widget works only if ArticleCreate or ArticleSend is selected in the Events widget. Filter for the sender type of the ticket. Possible values are agent, system or customer. Filter for the customer visibility. Possible values are Invisible to customer or Visible to customer. Filter for the communication channel. Possible values are Chat, Email, OTRS, Phone or SMS. If Yes is selected, attachments will be included to notification. Selecting No will not use this feature. Filter for blind carbon copy field. Filter for carbon copy field. Filter for the sender field. Filter for the subject field. Filter for the main recipients field. Filter for an SMS phone number. Filter for the SMS text. Filter for an SMS transaction number. One or more agents can be selected who should receive the notifications. One or more groups can be selected whom agents should receive the notifications. One or more roles can be selected whom agents should receive the notifications. If this option is checked, the notification will be sent even if the agent is currently out of office. Notify users just once per day about a single ticket using a selected transport. Enable or disable this notification method. A notification method can be email, web view or SMS. To use the SMS notification method, Cloud Services need to be enabled. Additional recipients can be added here. An article will be created if the notification is sent to the customer or an additional email address. Select which email template should be used for the notification. Additional email templates can be added by placing a .tt file into the folder <OTRS_Home>/Kernel/Output/HTML/Templates/Standard/NotificationEvent/Email/. See the existing email templates for an example. Checking this option will encrypt the notification email. To use this feature, PGP Keys or S/MIME Certificates need to be enabled. Sign only the notification email with PGP key. If no PGP keys have been added to the system, this option is not visible. Encrypt only the notification email with PGP key. If no PGP keys have been added to the system, this option is not visible. Sign and encrypt the notification email with PGP key. If no PGP keys have been added to the system, this option is not visible. Sign only the notification email with S/MIME certificate. If no S/MIME certificates have been added to the system, this option is not visible. Encrypt only the notification email with S/MIME certificate. If no S/MIME certificates have been added to the system, this option is not visible. Sign and encrypt the notification email with S/MIME certificate. If no S/MIME certificates have been added to the system, this option is not visible. Select the method, that should be used if signing key or certificate is missing. Select the method, that should be used if encryption key or certificate is missing. 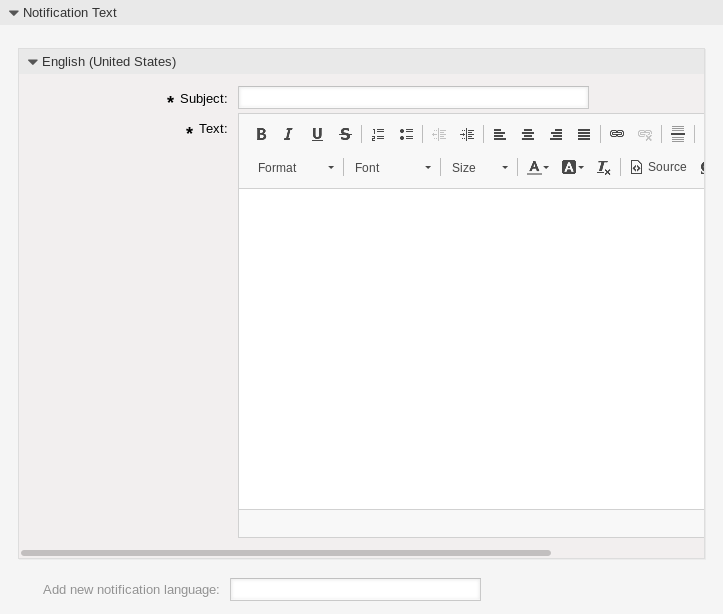 The main content of a notification can be added for each languages with localized subject and body text. It is also possible to define static text content mixed with OTRS smart tags. The localized subject for a specific language. The localized body text for a specific language. Select which languages should be added to create localized notifications. The language of the customer or agent will be used as found in the customer and agent preferences. Secondarily, the system default language will be chosen. The fall back will always be English. Deleting a language in DefaultUsedLanguages setting that already has a notification text here will make the notification text unusable. If a language is not present or enabled on the system, the corresponding notification text could be deleted if it is not needed anymore. (1, 2) Use of regular expressions as a filter do not work here.